Punta Arenas in Chile is one of those places that has an ‘edge of the earth’ feel about it. It’s a busting, vibrant little town, but sitting as it does at the very southern tip of South America, it is effectively hemmed in by cold, open oceans on three sides and the imposing Andes to the north. From Chile, it is only accessible by plane or boat, yet this effective isolation adds considerably to its appeal and charm. To get to it is time consuming from anywhere – 2 days from the UK - but the effort is worthwhile because it is the gateway to the wilds of Patagonia and the grandeur of Torres del Paine National Park. 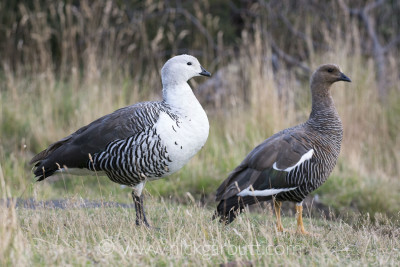 Upland or Magellanic Geese are easily seen: male on the left, female on the right. There is always added excitement when visiting a place for the first time, and although I’d previously briefly spent time in nearby Ushuai (in Argentina, en route to Antarctica), this was my first experience of southern Chile. For a long time Torres del Paine had been high on my list of ‘must see’ places, firstly because I’d seen sumptuous photos of the breathtaking mountains and scenery and secondly because of the park’s increasing reputation as being probably the best place to see pumas – anywhere. On the first morning, before heading to Torres del Paine, we travelled south from Punta Arenas down the coast road to explore the shoreline of the Straits of Magellan. This was not only a relatively sedate introduction, but also provided an opportunity to see some coastal and pelagic species. The Straits of Magellan are relatively narrow and immediately across to the east Tierra del Fuego was clearly visible, while to the south Dawson Island was more distant. 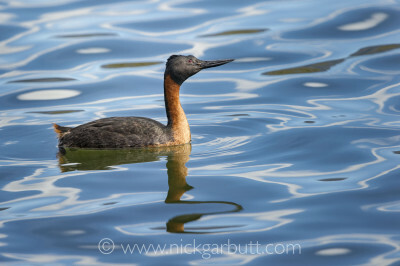 On the drive south many of the commoner shore and sea birds were easily seen, including flying steamer duck, crested duck, kelp goose, imperial cormorant, Magellanic cormorant, Magellanic oystercatcher, kelp gull, dolphin gull and brown-hooded gull. Out to sea there were occasional and more distant sightings of Chilean skua, southern giant petrel and black-browed albatross. A lone Magellanic penguin, probably a juvenile, was also spotted resting on one of the beaches. Very close to shore there were several encounters with small pods of Peale’s dolphins, some of which were clearly feeding in shallow water. On the landside, in more sheltered areas, patches of stunted southern beech trees managed to gain a foothold and formed areas of Lilliputian forest. There were also some small freshwater lakes, but for the most part the terrain was open, windswept and largely barren. Yet there are, of course, species that thrive in such harsh environments and many were evident, including upland goose, southern caracara and chimango caracara, while around the lakes Chiloe wigeon, yellow-billed (speckled) teal and Chilean flamingo were easily seen. 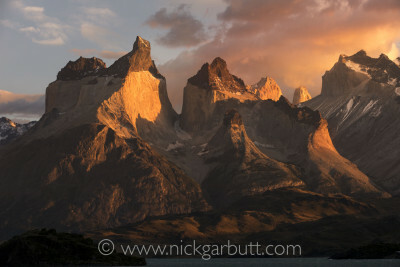 During the afternoon drive north to Torres del Paine, the anticipation built. Along the way many of the same birds were seen, with the addition of some new species, including Darwin’s (lesser) rhea, ashy-headed goose, red shoveler, black-faced ibis, red-gartered coot, southern lapwing, American kestrel and long-tailed meadowlark. Two larger iconic Andean species were also seen for the first time – more distant views of black-chested buzzard eagle and two magnificent Andean condors soaring high above a rocky outcrop and a juvenile bird on the ground feeding at a carcass along with several Southern and chimago caracaras. We also encountered a couple of new mammals – our first guanacos grazing on open ground and a family of southern grey foxes that had become habituated around a roadside café / rest house. At the delightful little coastal town of Porto Natales, there was a welcome coffee break and along the adjacent shore numerous black-necked swans and coscoroba swans were seen feeding in the shallow water, along with large numbers of imperial cormorants resting on the old piers together with kelp and brown-hooded gulls. From Porto Natales, it is only another 100km or so to the park and as we approached, we began to get tantalizing views of the iconic mountains through gaps in the nearby hills. As the terrain became more rugged and less cultivated more and more guanacos were clear to see, many often gathering in small herds. By the time we reached the park gate, dusk was beginning to descend and in the gloom it became increasingly difficult to see anything other than vague shapes. Our first attempts to look for pumas would have to wait until first light of a new day. 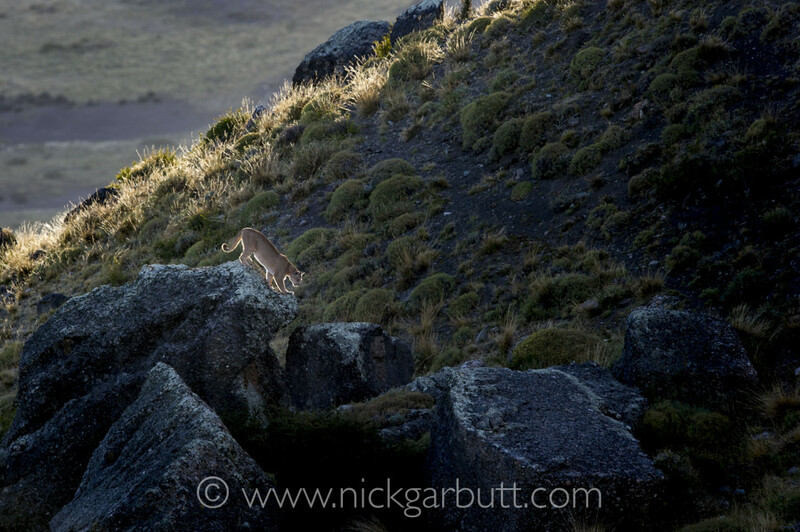 Although pumas might potentially be seen in many parts of the park, the best areas, not surprisingly, correlate to the areas that support the highest densities of guanacos – their main prey species. These areas lie mainly on the eastern side of the park and to the north of Lake Sarmiento, and cover both land within the national park boundaries and private ranch land. During our stay in Torres del Paine, these were the areas we planned to concentrate our puma watching efforts, as well as making excursions to other parts of the park, where different things of interest might be seen. Our super guide Claudio (Vidal) was instrumental in planning the daily activities throughout our stay and on our first morning he suggested we leave the lodge before first light and head out to the east of the park and Lake Amarga, which lies just beyond the park boundaries on private land. The reasoning was that this might offer the opportunity for good sunrise photos of the famous Towers of Torres del Paine, as well as the chance of puma spotting. The skies were clear and filled with stars when we left the lodge, boosting optimism for a good sunrise. It took nearly half an hour to reach the lake and it was still very murky in the shadows of the mountains, but the peaks were beginning to illuminate with the golden glow of the sun’s first rays. The prospects of some memorable sunrise photos seemed good. 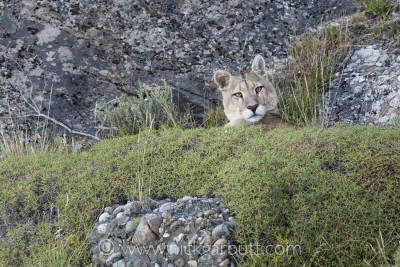 However, just after reaching the lakes’ shore a puma was spotted, sitting on a mound no more than 50m off the road. We of course stopped immediately and were transfixed by the sight – the first puma seen by anyone. It was a female and she seemed slightly nervous – and shortly afterwards the reason became clear – as two small cubs appeared from the thick vegetation. Sadly it was apparent the mother was not completely comfortable at being watched and she began to move off with her cubs slowly up the hill. We were able to watch them climb to the edge of a gully before they disappeared from view. It was the best possible start to the trip, but did of course mean we missed the glorious alpenglow sunrise that developed on the Towers. You can’t have everything. The remainder of the morning was spent exploring some of the other well-known areas on the eastern side of the park, including the Paine Waterfall and Lake Azul. 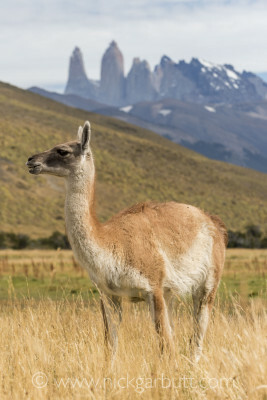 There were numerous sightings of guanacos – it was evident they were everywhere on the eastern side of the park – as well as a handful of birds that were now becoming familiar, like spectacled duck, yellow-billed teal, black-faced ibis, black chested buzzard eagle, red-gartered coot, southern lapwing, chimango caracara and American kestrel. Some new birds for the trip were, white-winged coot, wren-like rushbird and fire-eyed diucon. An additional mammal was also seen – Patagonian Hairy Armadillo – close to the shores of Lake Azul. In the afternoon we returned to the area on the border of the park and the neighbouring private land and this time walked away from the road to the fence line. We had been informed this was a favourite haunt for a particular female puma and the area in general was frequented by several other pumas, both males and females, at various times. Like most cats the pumas tend to be fairly inactive during the middle of the day, so the best chance to catch one active is late on as dusk approaches. It took us around 30 minutes to walk to the most likely area on the fence line separating the park from the private ranch land. Then it was just a question of keeping our eyes peeled and waiting. 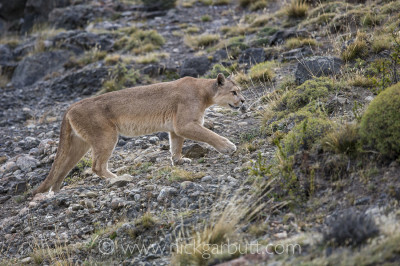 We didn’t have to wait very long – perhaps 30 minutes – and then out of nowhere a female puma appeared. In fact she had been asleep in the long grass all the time, but around 7.00pm got up, stretched, groomed her self briefly and then began walking in a direction almost straight towards us. This was a female very familiar to the local guides, a cat they knew to be completely tolerant of being watched from close quarters – and as quickly became apparent remarkably close in fact. 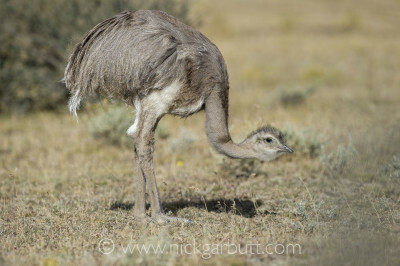 She walked through the long tussock grass in to a more open shorter grass area to a point she was no more than 20m away, then turned slightly and began walking parallel to the boundary fence, all the time scanning around, presumably looking for guanacos that she might attempt to hunt. There were several guanacos within the vicinity and they soon cottoned on to the pumas’ presence and began alarm calling – a peculiar sound somewhat reminiscent of a high-pitched horse whinny. The puma continued to walk parallel to the boundary and we were able to follow and photograph her for the next 30 or more minutes covering a kilometer or so. After this she began to move over more difficult terrain and as the light was fast fading, we decided to leave her and head back to the lodge. It was a memorable end to our first full day in Torres del Paine. The first day largely set to tone for the daily schedule and routine we were to follow for the next six days – out before first light to look for pumas, back mid-morning for a late breakfast / brunch, then out again mid-late afternoon until dusk again looking for pumas. Most of the searching concentrated in the areas north of Lake Sarmiento, both inside the park and on the adjacent private ranch. There were times we had to search hard for success – sometimes covering a fair amount of ground over the moorland and waiting for signs of activity, before seeing a puma in the distance. At other times, success came a little easier – the very tolerant female was co-operative on a couple more occasions and provided excellent encounters, as did one male we found resting amongst boulders. By the end of the week, we reckoned we had seen eight or perhaps nine different individuals, albeit some were at long-range and brief. After four nights at Hotel las Torres, we moved to the southern part of the park and the more rustic Hosteria Pehoé. What the lodge lacked in charm and comfort it made up for in location and the spectacular view of the Paine massif it afforded looking out across Lake Pehoé. Having Hosteria Pehoé as a base, also allowed us on one afternoon to travel to the western side of the park and Lake Grey. This area is appreciably wetter than the east, so instead of a landscape dominated by barren moorland, there are significant stands of southern beech forest. A walk through an area of this forest to Lake Grey offered the chance to pick up a few bird species, these included; Chilean flicker, Austral parakeet, dark-faced ground tyrant and Austral thrush. And on a swift flowing stream a pair of torrent ducks was seen. 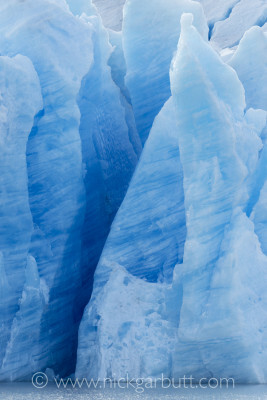 The afternoon boat trip on Lake Grey to Grey Glacier was certainly spectacular and well worthwhile. In total the round trip to the front of Grey Glacier lasted around three hours, with a good 40 minutes or so close to the glacier itself, which is an extension of the great Southern Patagonian Ice Field. Our initial scans and searches revealed nothing, but there were so many humps and hollows to potentially conceal a cat, that a second look was worthwhile. Having moved position to achieve an alternative perspective, I scanned again. Half way through the scan, I just over a ridge in the middle ground, I saw the head of the puma. The cat was sitting very upright and eyeing the two guanacos that were around 100m away. Shortly afterward the puma stood and began walking – we were able to follow it as it strolled towards a marshy area and then through the reeds in the margins. The intensity of guanaco alarm calls increased and they quickly ran in the opposite direction. We were able to watch the cat walk over the moorland for another 200m or so, before it turned around a ridge and disappeared from view. There was one final glorious twist before we left the Torres del Paine region. Some 15km after leaving the park, we encountered a couple of Andean condors flying parallel to the road and both heading in a direction directly in front. 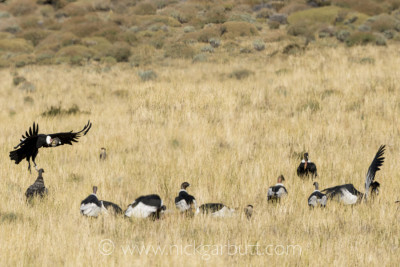 Shortly afterwards the reason became clear – some 200m off the road in a field there was clearly a carcass of some sort (probably a sheep) and gathered on and around it were over 40 condors, with many others circling above high in the sky and gradually descending. In addition there were numerous Southern and chimango caracaras. 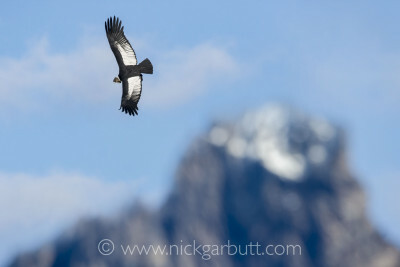 We watched from some 20 minutes, by which time over 50 condors had gathered. Given this birds’ iconic status - the epitome of all that is wild and free in rugged Patagonia - it was a fitting finale to our stay in Torres del Paine.